ProX T-6MRSS DJ Rack 6U Bottom x 10U Mixer Slanted Top Combo Flight Case. 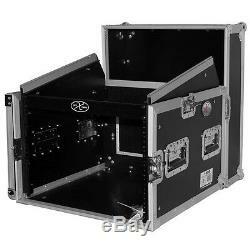 PROX CASES T-6MRSS 6U 10U MIXER DJ COMBO RACK FLIGHT CASE. Brand New In Factory Sealed Box ProX T-6MRSS Pro DJ Combo Case- Built to the most demanding specifications. 6 Space Amp Rack 10 Slanted Top 6U 10U Mixer DJ Combo Rack Flight Case. Pro X T-6MRSS 6 Space vertical rack, 10U slant mixer rack system has all the best features you are looking for in a world-class flight case: strength, durability and reliability with flexible options and sizing for different applications. This heavy-duty professional combo rack is 19 deep and features 6U front loading and 10U top loading rails for convenient security for a wide variety of pro DJ mixers. Other design highlights include a large swinging rear door (for easy wiring) with a beveled cable hole for permanent or semi-permanent installation. It also includes two handles on either side of the case for convenient transportation. PROFESSIONAL COMBO RACK 19 DEEP. TOP AND FRONT REMOVABLE LIDS. LARGE REAR SWINGING DOOR FOR EASY WIRING ACCESS. Durable and solid rack rails. ATA 300 Flight Ready Road Case. 2 Spring action Handles per Side. Easy locking fit and tongue. Heavy and powerful steel ball corners. Industrial strength latches and rubber feet. Includes mounting hardware and padlocks. 21.5&###x201D;L x 24&###x201D;D x 18.5&###x201D;H. 26 x 23 x 20. VIP Pro Audio & DJ Equipment has been THE destination for DJ entertainment and lighting industry professionals for over 25 years, combining knowledge and experience with our highly specialized group of professionals to bring our loyal customer base the right, low-priced solution for every situation. From PA systems, turntables, and rack gear to cables, stands and subwoofers, VIP Pro Audio has all facets of the market covered! Sound and lighting needs, we at VIP Pro Audio are never satisfied with the norm. From DJs and producers to rental contractors and lighting designers, we strive to provide our clients with innovative design ideas and the highest quality components at a low, competitive price. The United States, Canada, Worldwide. Nearly every order received by 3PM Eastern ships the SAME DAY! Products like software, speakers, tubes, personal items (such as in-ear monitors, etc), and items which are not normally stocked "Special Orders", discontinued products, close-outs, used products, etc. VIP Is The Place To Be.. The Largest Selection Of Pro Audio, DJ & Lighting Equipment Unde One Roof. A Tradition Of Excellence Since 1988. Celebrating 30 Years Of Commitment To Quality & Service. Proud To Be Most Awarded & Top Rated Dealer. View our great user feedback. This listing is currently undergoing maintenance, we apologise for any inconvenience caused. The item "ProX T-6MRSS DJ Rack 6U Bottom x 10U Mixer Slanted Top Combo Flight Case" is in sale since Sunday, December 31, 2017. This item is in the category "Musical Instruments & Gear\Pro Audio Equipment\Cases, Racks & Bags". The seller is "vipaudio215" and is located in Brooklyn, New York.